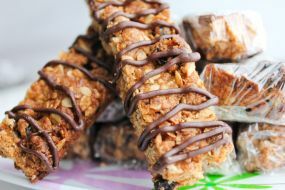 Lentil Granola Bars is a Canadian food recipe with chocolate drizzled over top. Place rack in centre of oven. Preheat to 350F. In medium bowl, mix coconut, oats, brown sugar, bran cereal and cinnamon. Add lentil purée, oil, egg and vanilla. Mix until dry ingredients are just moistened. Spread over a 10½ x 16 nonstick cookie sheet. Bake 30 minutes, or until lightly browned. While bars are still warm, drizzle chocolate over top and cut into 35 bars.